Ever since I made Pumpkin Cheese Bread that turned out so light and moist I have been on a quest to find a soft white bread recipe. 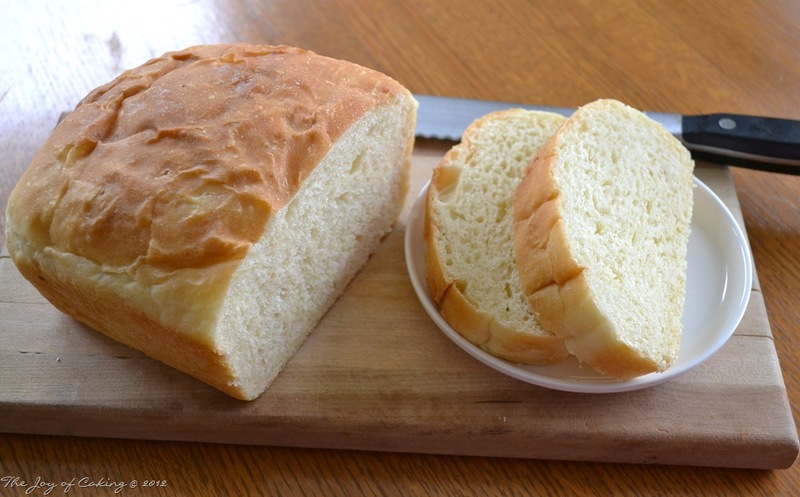 When I found this bread recipe in an older Betty Crocker Cookbook I decided to give it a try although I’m not sure that the recipe is as important at technique when it comes to bread making. I defied the recipes instructions and made the bread based on a few techniques that have worked well for me in the past. 1.) I used as little flour as I possibly could. I prefer the dough be a little sticky prior to, and during the first kneading. 2.) I tried to avoid overworking the dough. I mixed by hand, and didn’t knead bread for an extended period of time. This recipe advised to knead it for 10 minutes (prior to the first rising) – I kneaded it for about 5 minutes. 3.) When I punched the dough down (after the first rising) I briefly kneaded the dough to get the air bubbles out and then formed into loaves. This recipe called for dividing the dough into halves and rolling each half into a 18×9 inch rectangle. 4.) I baked it in a 350 degree oven for about 25 minutes. Not a 425 degree oven for 30-35 as this recipe called for. In a large bowl, dissolve the yeast in 3/4 c. of warm water. Stir in remaining ingredients. Add the 6 1/2 cups of flour to stiffen the dough but leave it slightly sticky. Mix thoroughly. If you feel it’s necessary to add more flour, do so gradually. On a lightly floured surface knead bread until it forms a nice round ball and is no longer sticky (about 3-4 minutes). Place in a greased bowl and cover with plastic wrap. Let rise until doubled – about 1 hr. Punch down and knead briefly to remove air bubbles (about 2 minutes), shape into loaves. 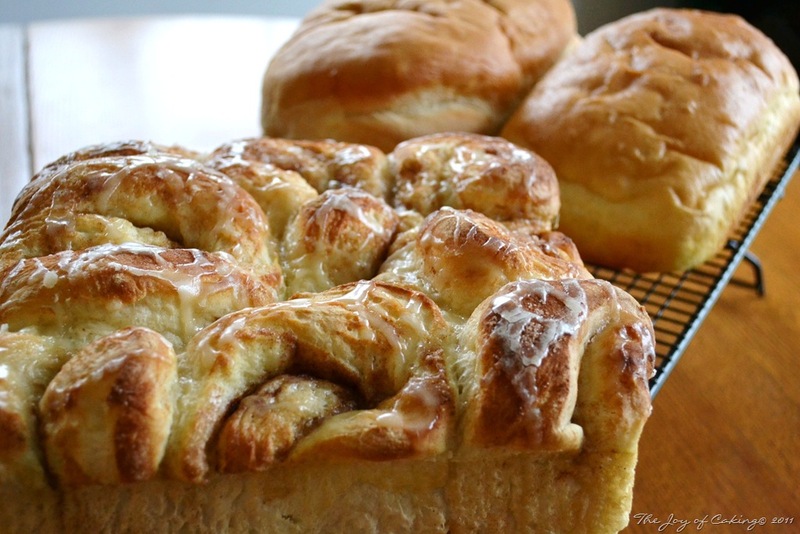 In this case I split the dough so I could make an 8×8 inch pan of cinnamon rolls and got one large and one medium-sized loaf of bread. Let the loaves rise until doubled – about 1 hr. Bake in a 350 degree oven for about 25 minutes. The bread is done when it sounds hollow when tapped. Brush with the tops with softened margarine or butter. 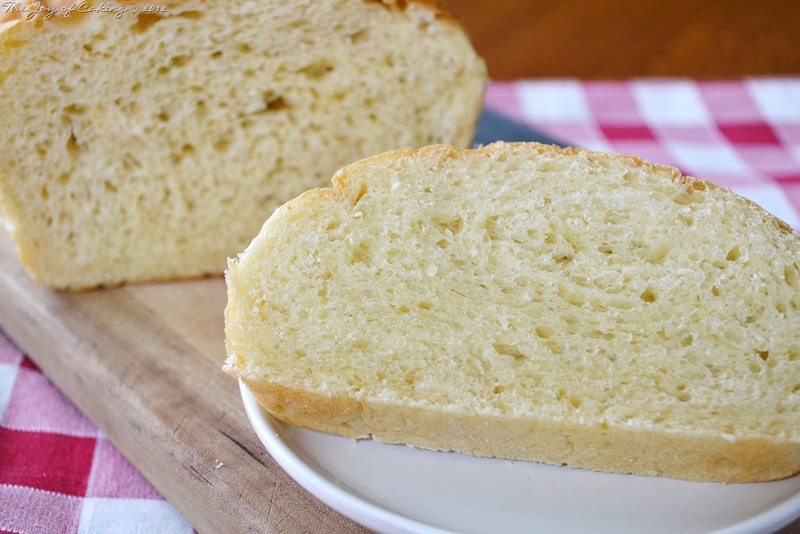 This bread turned out super soft and moist just as I had hoped for. Do you like making bread? Do you have any bread making tips?